Summers and Camp Belong in Maine…And So Do You! Camp Laurel South is a proud member of the Maine Camp Experience. We think Summers and Camp Belong in Maine…And So Do You! Enter to win a Maine Vacation by visiting the Maine Camp Experience website…just follow this link: www.mainecampexperience.com/visit. There’s a reason people talk about Maine in such reverential tones. The state has 2,200 lakes. Warm, inviting, crystal clear bodies of water that make most other lakes look like swimming holes. There are hundreds of thousands of acres of pine forests. Temperate days and comfortable nights, where you feel you can touch the sky. And more miles of beautiful coastline than California. Even mountains — Mt. Katahdin is one of the highest peaks in New England. It’s the perfect setting for summer, one that can’t be matched anywhere. As Forbes noted, there’s something unique about summer camps in Maine. From our acres of prime waterfront to our unspoiled wilderness, Maine has been the only destination of choice for thousands of camp families, with friendships that stretch from generation to generation. Our summer camps feature the finest facilities, the most sought-after staff and the most unique range of off-site trips. And with more than 100 Maine camps, there’s something to suit everyone. Your children will learn to stretch their boundaries and experience life through the eyes of someone whose life is not a mirror image of their own. Maine is a lot closer than you think. An easy drive or flight from most places in the Northeast– about the same distance as a winter ski trip. A great vacation for the entire family. Whether you’re looking for the famed seaside resorts of Bar Harbor and Camden or a lodge on one of our pristine lakes, Maine has something for everyone — especially kids! Come and visit our Maine Camps and you’ll never want to leave. 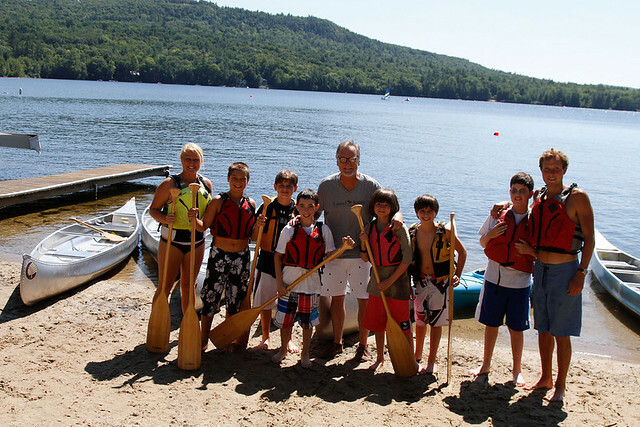 This entry was posted in Uncategorized and tagged life at summer camp, Maine, Maine Camp Experience, Maine Vacation, prepare for summer camp, summer camp 2011, summer camp activities, summer camp traditions, summer camps on June 27, 2011 by Camp Laurel South. 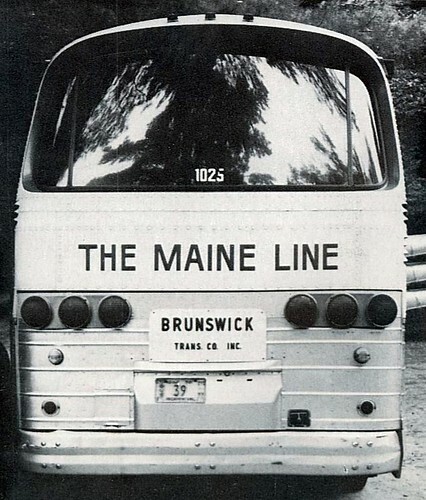 We’re proud to call Maine home. We’re just as proud to utilize the resources of the entire state and to give hundreds of campers an experience unequaled anywhere else. At The Laurel Camps there’s more than enough room for an exciting depth and breadth of activities. Sports ranging from baseball, soccer, softball and lacrosse to volleyball, tennis and archery. Equestrian. Swimming, sailing, canoeing, kayaking, wakeboarding, windsurfing and waterskiing on crystal-clear lakes. Summers in Maine are never too hot. And the nights are cool (and starry) enough for age-old traditions like campfires and s’mores. But for campers and staff at Laurel and Laurel South, all of Maine is our playground. We hike tall mountains like Katahdin. We head into the pine forests for ropes courses, rappelling and mountain biking. We explore the coast and ocean-side sites like Acadia National Park, Ogunquit and Bar Harbor. Campers come to Maine from across the country. Whether they’ve been here in the winter to ski, or have never experienced the wonders of the state, they quickly realize it’s an amazing, magnificent place – vast yet intimate, wild yet welcoming. Parents love it too – particularly if they plan a day or three in the trendy city of Portland, with a side trip to Kennebunkport, Camden or (of course) Freeport to visit L.L. Bean! 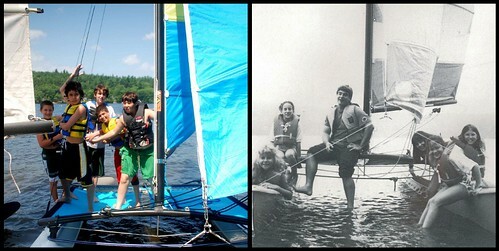 It’s all part of the Maine camp experience – discovering new things, no matter what your age. And you never know…you may be lucky enough to spot a Moose. 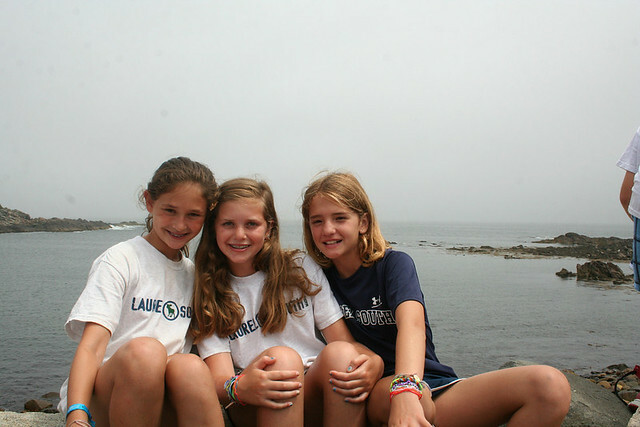 This entry was posted in Uncategorized and tagged American summer camps, camp activities, camp for kids, camp laurel south, life at summer camp, Maine Camp Experience, outdoor classroom, summer camp activities, summer camp traditions on May 12, 2011 by Camp Laurel South. Concern about the obesity crisis has sprung to the forefront of the camping industry. Cedric Bryant, Ph.D. and Chief Scientist for The American Council on Excercise, was a keynote speaker at the 2011 American Camp Association’s (ACA) National Conference, attended by thousands of camp professionals. In his address, Dr. Bryant discussed the growing issue of obesity and praised the ability of summer camp to transform poor habits through exercise. Most traditional summer camps offer children a healthy mix of hobbies and athletics. Camp staff members encourage campers to participate in everything that’s offered to them, even that which they might not necessarily do or try at home. There is also something to be said for the fact that many summer camp activities, including dining, are scheduled into a child’s day and carried out in a group setting. Access to food is limited throughout campus, and eating is typically not permitted in bunks. Quite simply, obtaining food at camp is not as easy as walking into the pantry or opening the refrigerator on a whim for lack of something better to do. New research has established many benefits to family meals. One potentially underrated advantage is that dining as a unit may keep consumption in check by limiting what nutritionists call the “eating area”, the combination of time and space in which eating occurs. “This strategy can help determine if they [children] are really hungry or just bored,” says Thomas. 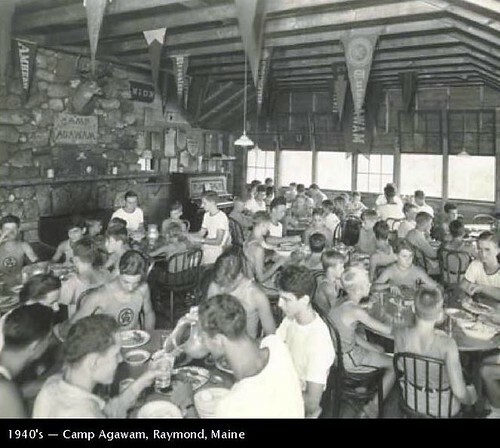 Meals at summer camp are held at specific times in a designated place—usually a dining or mess hall—and campers dine together, often with their bunkmates. Counselors supervise, insuring that everyone receives food and reporting any changes in a camper’s eating patterns. The four day 2011 ACA conference also featured seminars that addressed issues such as how to work together to improve the overall health and nutrition of campers, understanding the relationship between nutrition and wellness and using that knowledge to help campers be high achievers through healthy bodies and minds, and adding healthy options to dining room menus, particularly for those campers who require special diets. Indeed, though many camps are constantly striving to improve in these areas, the notions introduced in these seminars are not new. Meals served by most summer camps are carefully planned and balanced in accordance with USDA recommendations. Many camps also encourage their campers to make healthy choices at mealtimes by providing several fruit options in the morning and salad bars at lunch and dinner. Vegetarian alternatives are typically available and, increasingly, more attention is being given to rising nutritional challenges such as diabetic or gluten free diets. All of this is enough to make summer camp worth considering as a combatant to the type of lackadaisical lifestyle that leads to poor eating habits and, possibly, obesity. This entry was posted in Uncategorized and tagged American summer camps, benefits of camp, building character, camp activities, camp for kids, camp laurel south, education at summer camp, exercise at summer camp, fighting childhood obesity, fitness and nutrition at summer camp, fitness at summer camp, health at summer camp, healthy eating at summer camp, life at summer camp, nutrition at summer camp, summer camp, summer camp 2011, summer camp activities, summer camp as education, summer camps on March 15, 2011 by Camp Laurel South. In today’s hyper-fast, multi-tasking world, one of the great attractions of camp is tradition. Each camp passes down its own stories and lore. Campers appreciate that they’re enjoying some of the same activities, in the same way, as campers before them have done for generations. But few people realize just how much history the camp industry embodies. 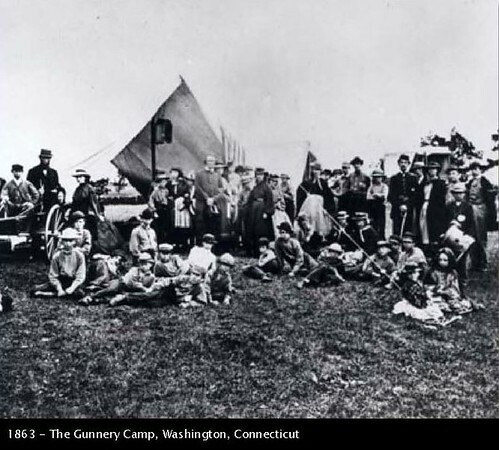 The first camp – called the Gunnery – was founded in 1861 in Washington, Connecticut. That’s right — camping is as old as the Civil War, and this year celebrates its 150th anniversary. Early campers enjoyed boating, fishing and trapping. It’s pretty impressive that two of those activities survive at camps, a century and a half later. An 1876 camp was created to take “weakly boys” into the woods. 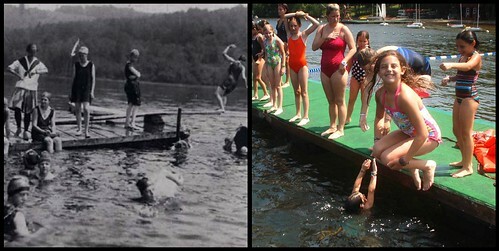 We wouldn’t use those terms today – but camps still serve all kinds of children, in all kinds of ways. And we’re still in the woods. The first YMCA camp was Dudley, in 1885. It’s still around – the longest continually operating camp in the United States. Scores of other camps date back to the late 19th and early 20th centuries. With over 100 camps – some dating back 100 years, welcoming scores of camping “generations” – Maine has long been one of camping’s most popular states. Camping boomed nationally in the 1950s and 60s – along with much of post-war America. In 1948 the American Camping Association adopted Standards – the basis for ACA camp accreditation. There are currently 300 Standards for health, safety and programs. They’re recognized by courts and government regulators – a seal of approval for any camp to which parents entrust their most precious possessions. The ACA was a pioneer in anti-discrimination resolutions. The first was adopted in 1950. Since then, the industry has continued to emphasize youth development. Camp directors constantly study research in areas like child and adolescent development, and risk prevention. They understand that positive experiences, strong relationships, challenging opportunities and solid personal values are vital to helping young people grow into healthy, caring and responsible adults. Frederick W. Gunn and his wife Abigail might not have used terms like those 150 years ago, when they founded The Gunnery Camp. But they intuitively understood the many benefits that camping provided. All of us in this important industry proudly honor the traditions of the past. My colleagues and I will not be here 150 years from now to carry them on. But we’re confident our successors – and our camps – will. This entry was posted in Uncategorized and tagged American summer camps, camp activities, camp community, camper stories, history of camp, lessons at summer camp, life at summer camp, summer camp activities on March 8, 2011 by Camp Laurel South. With the Center for Disease Control and Prevention (CDC) reporting that nearly 1 in 5 children between the ages of 6 and 19 is obese, it has become imperative that we, as parents, make as much effort to set our children up for success in establishing proper food habits, just as we would in other areas of their lives. Three primary causes consistently cited for childhood obesity are lack of physical activity, an unbalanced diet and overeating. An often overlooked benefit to summer camp is the significant impact it has in curbing childhood obesity by promoting an active lifestyle and healthy eating practices. In this multi-part series, we will examine the efforts being made by summer camps to battle poor diet and exercise. Beyond traditional summer camp sports such as soccer, basketball, baseball, roller hockey and gymnastics, many camps are increasingly focusing on the development of extensive programs for such popular fitness activities as spin, running, weights, zumba, yoga and the martial arts. The instant popularity of these programs suggests that children have a natural interest in exercise and will engage in it of their own accord in the absence of many of the daily distractions that promote a more lethargic lifestyle but are not readily available at summer camp, such as computers, video game systems and television. The ability to participate in fitness programs as a form of fun also encourages campers to approach such activities with an open mind rather than as something forced on them and that is only done out of necessity. Some camps are also experimenting with nutrition programs that marry cooking activities with fitness. Such programs teach campers how to plan healthy meals and snacks and then prepare them. Cooking programs are among the most popular at summer camp. To merge them with nutrition is a clever way to demonstrate the importance of using discretion in choosing what we eat and consuming it in moderation. In the past, the idea of “diet,” as in depriving oneself of necessary nutrients, has been cited as a contributing factor in the growth of eating disorders and yo-yo dieting. For those who question the lasting effects of fitness and nutritional habits adapted at summer camp, statistics indicate that they won’t be going away anytime soon. According to the American Camp Association, more than half of children who pursue a new interest at camp will continue pursuing that interest once they return home. This entry was posted in Uncategorized and tagged American summer camps, benefits of camp, camp activities, fitness at camp, fitness programs at summer camp, healthy eating at summer camp, life at summer camp, summer camp, summer camp 2011, summer camp activities, summer camp fitness on March 3, 2011 by Camp Laurel South.